I collaborated with my wife on this art installation for the Oak Harbor Library. She designed the installation and I helped her with the technical aspect of building and installing the work. We measured the space and did architectural drawings which we used to create the entire piece off site. I cut all the designs out of 1/2″ plywood, joined and assembled what could be ahead of time and then applied a finish to the work after the illustrations had been painted. (The illustration panels on either side of the entryway are over 10′ tall, so it was necessary to join two pieces to achieve the height) We then brought it up in pieces and assembled it in about 8 hours with the help of my father in law. You can see additional images and read more about the artwork on my wife’s website thebookwood.com. 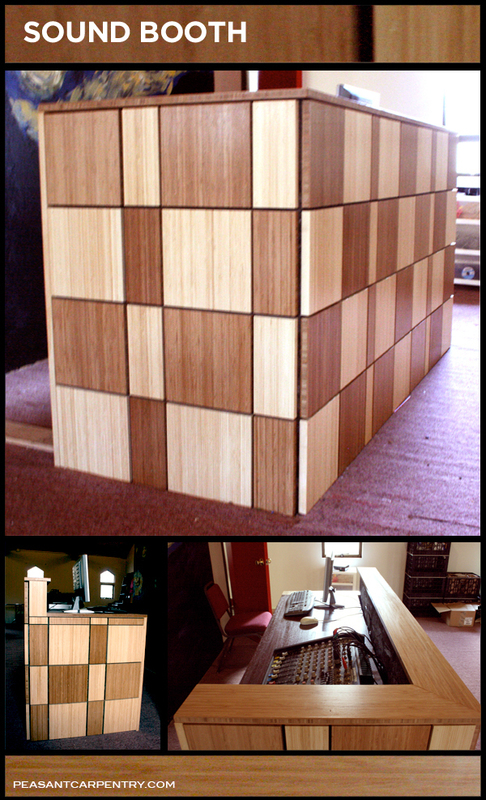 This sound booth was constructed from scraps of white and caramel bamboo atop an osb skeleton with a piece of cherry veneered plywood for the counter top.